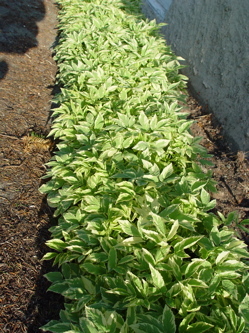 Bishop’s weed (Aegopodium podagraria), also known as goutweed, is a leafy groundcover, seen most commonly in its variegated form. It can spread very aggressively by rhizomes, so care must be taken when choosing a spot to plant it. 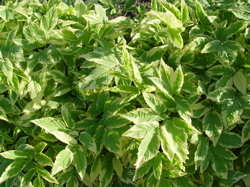 Many gardeners consider this invasive plant a pest and warn against planting it, but it is very hardy and will spread quickly to fill in a bare, neglected area. Bishop’s weed is perfectly suited for its garden bed on our property. It fills in a long, 3-foot wide strip of land between our house and our driveway. It’s bordered on all sides by concrete, so it will not be spreading anywhere soon. It’s also on the shady, north-facing side of our house that is not reached by our sprinkler system. Despite the lack of sun and the dry earth, it remains bushy and colorful throughout the summer, adding a bit of interest along an otherwise boring bit of driveway. For next spring, I am planning on planting either tulips or daffodil bulbs along this same strip of ground. The flowers will bloom just as the bishop’s weed begins to peek out of the dirt. As the flowers and their greenery fade, the bishop’s weed will just be reaching its 10 to 12 inches of height and will take over the strip for the summer. Great use for this aggressive, yet useful plant, Mike! We did similar as you described above. Unfortunately, our plants did not have permanent containment all the way around. We originally planted the Bishop’s Weed in the far back corners of two symmetrical/matching beds located right up against an extraordinarily dry/super-hot-in-Summer/deep-freeze-and-thaw cycles in Winter/once desolate/arid North-facing sides of our home entry stoop/porch. (one side NE & the other more NW, to be exact) Then, for the first few years, both areas of Bishop’s Weed stayed pretty well contained to where we had planted them and filled in their respective spots nicely. Then our NW Ohio region’s long forgotten wet weather period struck and made those suckers live up to their weedy name! I knew I was taking a chance putting them there at first, so it was totally my fault of course -but damn- I’d never met a more pushy herb ‘till I met these! To SUM IT UP: this über-low maintenance plant is great in contained, hostile & hard-to-make-anything live/grow areas…but, HEED NOTICE: if you do not contain these plants properly, by impenetrable and permanent measures, they will spread & spread & spread! & THAT’S 4 SURE! Peace, Happiness & Fruitful Gardening to All!